Corrugated memory straws are made in a continuous extrusion process where pellets of PP plastic are fed into a plastic extruder, which heats the plastic (for this product to approximately 460°F), it then compresses the molten plastic under high pressure to remove any air, and mixes any colorant into a homogeneous molten material extruding (pushing) this material through a pin and bushing into the corrugator. 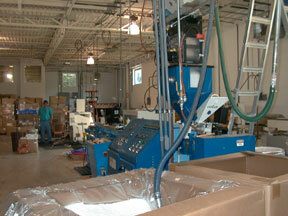 All SELA extruders are made in America. A corrugator is a machine with metal “blocks” which are rotating continuously around a channel, accepts the molten plastic into the blocks for forming, are inflated with compressed air, and then brought to the exit area of corrugator and goes into the puller/cutter for cutting into final straw length. SELA corrugators are servo driven for accuracy, and utilize blocks which are 2.25” long, which is why our available straw lengths are in multiples of 2.25”, less shrinkage during final cooling. All SELA corrugators are made in Germany. A chiller cools the corrugator to bring the temperature of the plastic down from 460°F to approximately 85°F , while the straw is being formed and cooled, in a length of 14’-18’ depending on the corrugator. All SELA chillers’ are made in Italy. The puller literally pulls the continuous chain of formed straws into the cutter with SELA puller/cutters being servo driven for accuracy and utilizes fiber optic eyes to “see” when the corrugates end and the cuff begins. A computer in the cutter then sends a signal to the servo driven knife to make a cut at an exact point we select long the cuff, normally in the middle, which is why most of our cuffs are 1.125” long. All SELA puller/cutters are made in America.